Amazingly, some people believe the origins of the stock market can be observed as far back as ancient Rome. Back in Roman times, organizations called "Societates Publicanorum" were formed that offered investments referred to as "partes" or what we now know them as - shares. These organizations offered partes to individuals to help the government with the building of public structures and perform other community/civic services. The shares were tradeable and had fluctuating prices based on the underlying project's success. This seems more orientated toward what we now know as the municipal bond market, but it didn't take much of an imagination for some industrious Romans to transfer the principle onto private industry and some scholars believe this did, in fact, take place. During the age of exploration, hundreds of new sailing expeditions set forth and many of the journeys were those of merchants looking to trade. As these expeditions became more frequent, alternative methods to finance them were needed. The concept of selling partnership agreements to investors by dividing ownership of explorations into shares dates back to at least to the 13th Century in Italy. These agreements were typically only offered to a small group of investors and were of a limited duration with shipping partnerships that applied only to a single sea voyage. The trading of these kinds of shares grew throughout Northern Europe and eventually, a group of cities created the Hanseatic League which provided services to offer the shares to more individual investors. This was only a glimmer of the origins of the stock market, because at that time there were still no paper shares issued, and there was no "after market" buying or selling of those share interests. In 1531, the Belgian "bourse" of Antwerp was the world's oldest financial exchange mainly trading in promissory notes, bonds and commodities. The word "bourse" originated from a family-run inn in the town of Bruges where 15th century merchants met to conduct financial affairs. The definition of the word bourse is: an exchange as an assembly meeting at frequent intervals, usually daily, consisting of the merchants and another person, who meet for the purpose of dealing without exhibiting, delivering or paying for their goods at the same time. This certainly had some of the beginning characteristics of the origins of the stock market. As word spread about Antwerp's success with trading financially derived investments, the enthusiasm filtered over into London's financial development activities. In 1571, officially opened by Queen Elizabeth I, The Royal Exchange was modeled after the Antwerp Exchange building and like the Antwerp bourse, it offered the opportunity for a large group of merchants to sell merchandise. However, as trade expeditions continued to form, The Royal Exchange also included a small group of brokers offering marketable share interests in various expeditions. In the early 1600s, the Dutch East India Company (Vereinigte Oostindische Compaignie) and later the Dutch West India Company were formed to trade spices between Amsterdam and East India (Indonesia). Similar to how companies now operate, the directors controlled the company's operations including multiple expeditions rather than a single one, but the financials of the company were not available for investors to study. Shareholders received a 16% dividend per year on their investments. The other thing the Dutch Companies did was to issue shares on paper and eventually, investors began offering to sell their shares to other investors. In fact, the oldest existing stock certificate discovered so far was issued in 1606 by the Dutch East India Company. In 1602, a new group formed the Amsterdam Exchange which was held outside on the New Bridge of Amsterdam where trading was done in bills, commodities and a small portion of share trading. 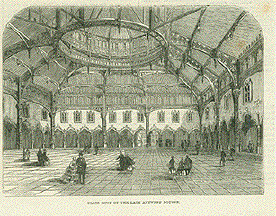 It was on the Amsterdam bourse that share interests were eventually traded hinting at the origins of the stock market. But at this point, there still was no stock market venue like we have today where shares are listed and traded in a market. In the late 1600s as more financial structures were being developed in London, including the first government bonds offered in 1693 and the establishment of The Bank of England shortly thereafter, share trading at The Royal Exchange was becoming more popular. a luxury shopping mall, 2008. After a while, as the stock brokering grew, it's said that the stock brokers were thrown out of the Royal Exchange because of their rowdy and rude behavior so they set up trading out of coffee houses along what was called Exchange Alley. In 1698, a stock broker named John Castaing working out of a coffee house began posting lists of British stocks and commodities and Dutch joint stock shares with price offerings and this activity eventually grew into the London Stock Exchange which officially formed in 1773. Similarly, financial strategies which included the share exchange model developed in Europe were introduced in America by some of the founders of our country. Photo: City Tavern in Philadelphia. In the United States, over 220 years ago, the first stock exchange was established in Philadelphia in 1790 and was called the "Board of Brokers." 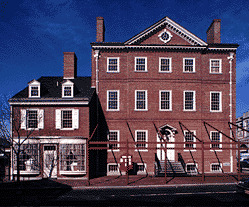 The Board met at the Merchant's Coffee House - better known, rebuilt and standing today as Philadelphia's City Tavern. The "Board of Brokers" later became the Philadelphia Stock Exchange in 1875 and it's now part of NASDAQ known as NASDAQ OMX PHLX. Contrary to popular belief, The Philadelphia Stock Exchange can be considered the origin of the stock market in America rather than the New York Stock Exchange. However, shortly after the establishment of the Board of Brokers, in New York in the year 1792, 24 stock brokers outside of 68 Wall Street under a buttonwood tree came together to meet daily and trade stocks and bonds. They agreed to make the market more structured, without manipulative auctions and establish a equal and fair commission structure. In 1817, the group reorganized and renamed itself the "New York Stock and Exchange Board." During his term as the first Secretary of the Treasury from 1789 to 1795, Alexander Hamilton was also noted to further endorse the use of stock exchanges to bolster growth in our country. He had studied the British models of stock exchange and promoted the idea to build a strong American economy. To commemorate his contribution to the origins of the stock market in America, there's a statue of him at Federal Hall on Wall Street and he is buried in the cemetery of Trinity Church located just down the street from the New York Stock Exchange. It's interesting and amazing to look back at the modest origins of the stock market - coffee houses and under trees - and compare those earnest beginnings to the world's principal financial centers as we know them today. Go from The Amazing Origins of the Stock Market to The Meteoric History of Online Stock Trading. Return from Origins of the Stock Market to Online Stock Trading Warrior Home. Accurately Identify Trends and Market Cycles The ultimate scanning program finds stocks that have historically performed during certain times of the year. Mine for these stocks using TradeMiner.